Long Way Down navigates gun violence through verse within the claustrophobic confines of a smoky elevator, conjuring a moment-to-moment story that must be followed until the fateful finale. Will’s brother has just been shot and killed, leaving Will traveling down six stories with a gun tucked into his waistband for revenge. He must follow his neighborhood’s Rules for avenging deaths, but past tragedies probe the future’s consequences and make Will’s confrontation more complex than he originally thought. 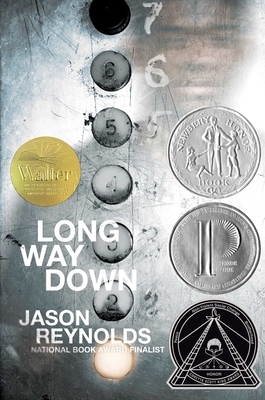 Fans of Reynolds’ previous All American Boys (co-written with author Brendan Kiely) or Angie Thomas’ The Hate U Give will find another worthy Coretta Scott King honoree in the electric and urgent Long Way Down.